Martini Dar Zamaria is Situated in the heart of the old Jedaideh district, Dar Zamaria & Orient House are a few steps from some of the city’s main attractions and a ten minute walk from the old market, the souq and the citadel. In the district you’ll find gift and souvenir shops, traditional silverware and jewelry shops, museums, religious sites and countless restaurants. 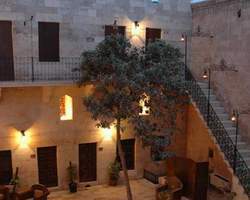 Today, Dar Zamaria and Orient House can receive guests in 50 rooms that were once the private residential quarters of the buildings. Dar Zamaria houses two restaurants. The courtyard restaurant, Al-Housh, functions as the main dinning area during all seasons although you might prefer to have your evening meals during the summer season in La Terrace; a restaurant on the roof of the hotel with a magnificent view of the citadel. The cultural diversity of Aleppo developed a luxurious culinary tradition that we take pride in serving. This culinary experience usually starts with the Mazza which is one of the most delightful features of Middle Eastern food. Meant to be enjoyed in a leisurely way, the Mazza is an assortment of light dishes (hot and cold), salads, pickles, dips and fresh baked bread. The list is endless and can provide for either a first course or the whole meal! The Mazza is usually followed by a mouth watering platter of grilled meats and kibbeh (a past of cracked wheat filled with minced meat). Kibbeh is an Aleppine specialty not to be missed. Western cuisine is also served and the restaurants also serve local seasonal specialties such as meat with cherry, fish and birds (Asafeer Al-Teen). Special requests ought to be made in advance to allow for suitable preparation. While cooking in this region is considered a pleasurable and creative activity, serving and dining is no less pleasurable in Dar Zamari.